A Good Time to Sell a Home, But Buyers Aren’t Interested? Here’s a bit of a quandary. While 2015 might be a good time to sell your home, fewer say they’re interested in buying, according to the latest monthly edition of the National Housing Survey from Fannie Mae. The government-sponsored enterprise noted that just 60% of respondents said they would buy a home if they were to move, a new all-time low for the survey. That number was down five percentage points from February and well below the 68% share seen a year earlier. At the same time, a new survey high of 46% respondents believe it is a good time to sell a home, which begs the question, who’s right? 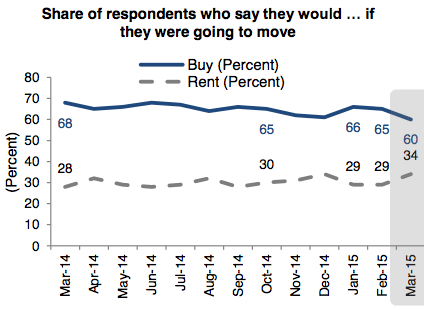 For the record, 66% said it was a good time to buy in March, down from 67% a month earlier and 69% a year ago. So it still seems there are enough individuals willing to buy, even if the numbers are trending lower. And because inventory remains super limited, it shouldn’t matter much if not everyone is taking the bait. In the report, Fannie Mae senior vice president and chief economist Doug Duncan said, “Consumers are being patient prior to entering the housing market,” emphasizing how critical income growth is. Put simply, prospective buyers aren’t making more money than they were last year or the year before, but asking prices are a lot higher than they once were. And they only seem to be rising. That should give plenty of people pause, though as I mentioned, with so few homes on the market, you only really need a small proportion of those folks to pull the trigger. In a related report, Zillow noted that would-be homeowners in most markets could break even on a home purchase in less than two years. Zillow Chief Economist Dr. Stan Humphries argued that if renters actually did the math, they’d realize this and we’d have millions more buyers in the market. However, he did stress that “buying a home is a huge commitment,” which is a personal decision and not for everyone. Still, those breakeven horizons are pretty short in some places. Among the top 35 metros nationwide, the Dallas-Ft. Worth leads the nation with an insanely short 1.2-year breakeven period. 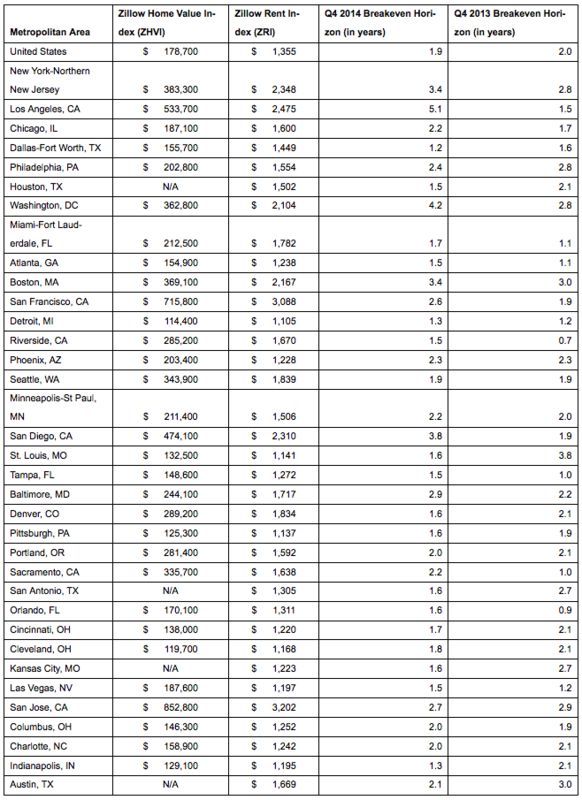 Right behind it were Indianapolis and Detroit, with breakeven periods of just 1.3 years. Zillow determines the breakeven period by factoring in all costs associated with buying versus renting, including down payments, closing costs, mortgage rates, insurance, taxes, and even maintenance and renovation costs. They also incorporate home equity growth via appreciating home prices for home buyers and income earned by renters via interest-bearing accounts. Of course, savings rates are terrible at the moment and a renter could possibly do a lot better investing than buy a home and still come out ahead. Overall, the breakeven horizon fell to 1.9 years nationwide in the fourth quarter of 2014, down slightly from two years flat a year earlier. However, it has risen dramatically in some places, so you really need to pay attention to your local real estate market. For example, the breakeven period was 1.5 years in Los Angeles during the fourth quarter of 2013, but surged to 5.1 years just 12 months later. It now has the longest breakeven period in the nation, followed by Washington D.C. (4.2 years) and San Diego (3.8 years).